These are FAQs about how to submit commission payments for the Referral Program. For questions about the Referral Program, check out the Referral Program FAQs. For general questions about Noomii's services for coaches, please see our FAQs for Coaches. How does the referral commission system work? What do I need to do when I get hired by a Noomii referral client? 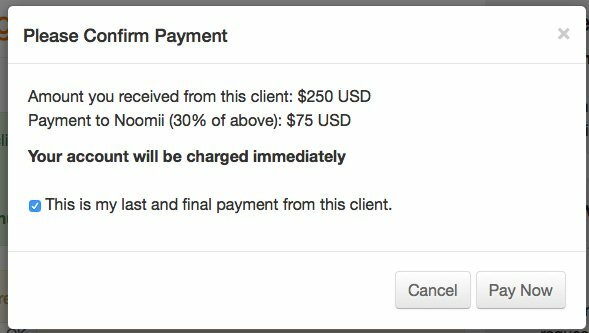 Does Noomii handle the client billing for referral clients? When do I submit referral payments? How do I submit referral payments? What do I do if a client takes a month off from coaching with me? If my client takes a 3-month pause from coaching, do I still have to pay a referral commission? How do I pay referral commissions if I collect coaching fees in a currency other than US dollars? What happens if my client asks for a refund after I have already paid my referral fees? When a client engagement is done, what do I do? How do I stop receiving payment reminders? When you get hired by a referral client, it is your responsibility to tell us when you get hired and to pay us a monthly commission for up to one year from the date the client first hired you. Although we use the honour's system to collect referral commissions, it does not mean that you can choose to skip or delay payment to us. The referral terms are very favourable to you, the coach, because we only require that referral commissions be paid in the month after you've been paid. This is explained in greater detail below and in our Referral Program Terms of Service. A dialog box will appear and you will be prompted to select the date of your first session. Commission payments are due for any coaching that occurs within one year following the first session. By completing the above steps, a monthly email notification will be sent to you prompting you to submit commission payments to Noomii (explained below). No. You still do the client billing the way you would do the billing with all of your other clients. The difference is that with your Noomii referral clients, you pay a commission to Noomii after you get paid by the client. Within the first week of the month following the month in which you got paid. Regardless of how you invoice your clients (month to month, session to session, by the 6-month package, etc. ), Noomii referral commissions are payable based on when you get paid, not based on when you do the coaching. If you get paid in January, commission payments are due the first week in February. If you get paid in February, commission payments are due the first week in March, and so on. 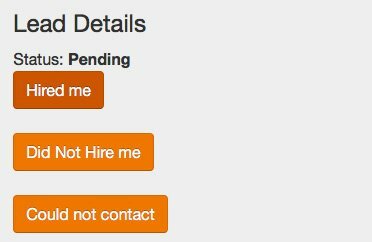 When you click the “Hired Me” button on a Noomii referral client, we will send you an email notification at the beginning of each month to remind you to submit your referral payments. Submitting a referral payment is easy. All you do is enter the amount that you got paid in USD and Noomii will automatically charge you a 30% commission based on the amount you entered. If you are still coaching the client but did not receive payment during the previous month, you must enter $0 so the system knows that you did not get paid. That way, we will not prompt you for your referral payments again that month. Jan 15: You deliver a free consultation. Jan 21: The client agrees to hire you on. The first session is scheduled for Jan 28th. Jan 22: You invoice the client for a 3 month coaching package for $1000. Jan 28: You have your first paid session with the client. Feb 6: You receive payment for $1000. Apr 27: The 3 month engagement ends but the client agrees to hire you for another month at $300. Apr 28: You invoice the client for $300. Apr 29: You receive payment for $300 and continue coaching for one month. May 27: The engagement is done. 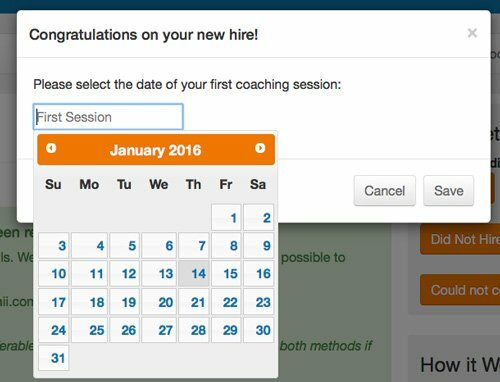 Jan 21: You would click the “Hired Me” button and indicate that the first coaching session is January 28th. On Feb 1, you would be sent an email to indicate how much you received in payment during the month of January. Although you invoiced the client, you did not get paid during the month of January so you would enter $0 in the payment box and click “Ok”. On Mar 1, you would be sent an email to indicate how much you received in payment during the month of February. You would enter $1000 and your credit card would be charged 30% of that amount. On Apr 1, you would be sent an email to indicate how much you received in payment during the month of March. You would enter $0. On May 1, you would be sent an email to indicate how much you received in payment during the month of April. You would enter $300 and your credit card would be charged 30% of that amount. On Jun 1, you would be sent an email to indicate how much you received in payment during the month of May. You would enter $0 and then click on the button “I am no longer coaching this client” and set the final session date to May 27. No problem. Just enter $0 for the month that you did not get paid. The system will continue to prompt you for payment every month until the final payment has been made. Only if the coaching occurs within the first 12 months from the day the coaching started. That’s why we ask you to set the first session date when you first indicate that a client hired you. The first session date starts the clock on the 12 month duration. All coaching services delivered within those 12 months are subject to the commission, even if there is a pause in between. If you collect your coaching fees in Canadian dollars, British Pounds, Euros, or some other currency, you simply need to calculate the US dollar equivalent when prompted to enter how much you received in payment in the previous month. For example, if you got paid $100 in Canadian dollars and the CAD to USD exchange rate on the day you got paid was 0.75, then you would enter $75 USD ($100CAD x 0.75USD/CAD exchange rate = $75USD) as the amount that you got paid. The referral commission is thereafter charged in USD. We would give you a refund for the corresponding referral fees. The good news is that it rarely happens. If it happens to you, please email support@noomii.com and we will manually reverse the charge. When you are done coaching with a client, there are two steps that need to be done in the following order. When steps one and two are complete, you will no longer be prompted to enter referral payment information. You can, however, restart the engagement if the client hires you again before the 12-month period is complete. Contact customer support at any time if you'd like to know more.